Indo-Tibetian Border Police Force is going to recruit fresher candidates in India for Constable Posts. So, those candidates who are willing to work with this organization they May apply for this post. Last Date of Apply 15-March-2018. Total numbers of vacancies are 134 Posts. Only those candidates are eligible who have passed Matriculation or 10th class pass from a recognized Board or Institution and a valid driving license (Transport) for Light or Medium or Heavy motor vehicle. 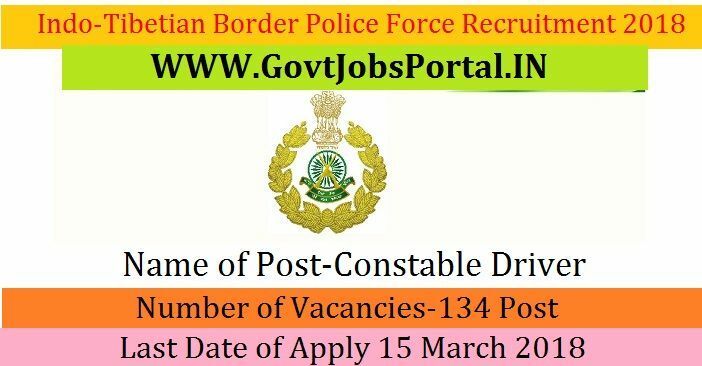 Indian citizen having age in between 21 to 27 years can apply for this Indo-Tibetian Border Police Force Recruitment 2018. Those who are interested in these Indo-Tibetian Border Police Force jobs in India and meet with the whole eligibility criteria related to these Indo-Tibetian Border Police Force job below in the same post. Read the whole article carefully before applying. Educational Criteria: Only those candidates are eligible who have passed Matriculation or 10th class pass from a recognized Board or Institution and a valid driving license (Transport) for Light or Medium or Heavy motor vehicle. Age Criteria: Candidates age limit should to be possess minimum age 21 years & maximum age 27 years. What is the ITBP Selection Process job? 4: Selection will be held on Skill Test. What is the Application Fee for these ITBP Jobs in India? The payment can be made by using Debit Cards (RuPay/Visa/MasterCard/Maestro), Credit Cards, Internet Banking, IMPS, Cash Cards/ Mobile Wallets. The Process for applying these 10th Pass jobs in India is to apply online. There is no other way to apply these Government jobs. Below we also share the direct official link to apply. We advise all interested candidates to click on that link for online application form. For Government Jobs alert on whatsapp send your request on following official Number @9625468942 (In request Msg Send your Name and State Name) " NOTE: You have to save this Contact Number in your contact list to get important Govt job alerts on Whatsapp. " NOTE: WE ARE NOT RESPONSIBLE FOR ANY JOB ISSUES, AS WE ARE SHARING INFORMATION BASED ON INTERNET. PLEASE CHECK THE OFFICIAL ADVT. ATTACHED WITH IN THE EACH POST, WHICH REPRESENT THE OFFICIAL FILE.